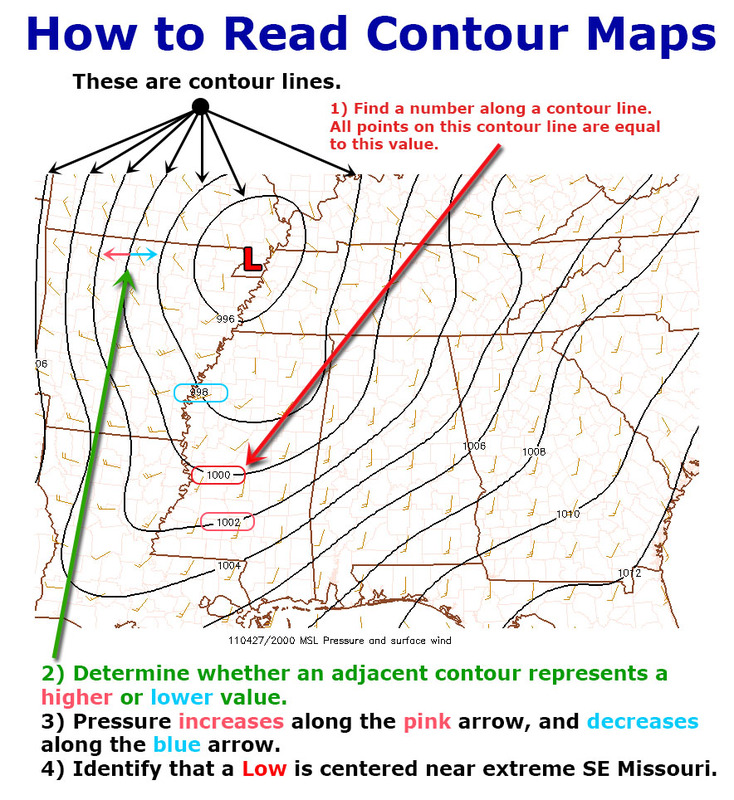 This page will help you learn to read contour maps. Contour maps are used to display meteorological data and weather model parameters. The image below explains how to find an area of low pressure on a map that is contoured with isobars of Mean Sea Level Pressure (MSLP). The contour lines on this map are isobars. “Iso” means “equal,” and “bars” are units of atmospheric pressure. Meteorologists use millibars. True or false: In the image above, the pressure in Kansas City, MO is lower than the pressure in Little Rock, AR. In the image above, a closed 990mb contour line straddles the border of KS and CO. Pick the answer below that is NOT a true statement. An area of low pressure resides somewhere within this closed contour line. The area of low pressure within this contour line is equal to 990mb. Low pressure within this contour line is less than 990mb. This map says that the air pressure in Amarillo, TX is higher than any point along the 990mb contour line. The air pressure at any point along the 990mb contour line is equal to 990mb. True or false: based on the image above, we know that Little Rock, AR is near a center of high pressure. Is Des Moines, IA near a center of high pressure in the above image? In the image above, is the pressure in Oklahoma City, OK higher or lower than it is in Ponca City, OK? Oklahoma City and Ponca City both have the same air pressure. In the image above, note the closed contour line in NW Arkansas. Is the pressure inside this closed contour higher than the pressure outside this closed contour? In the image above, is the pressure in Denver, CO less than 1012mb? This map has been analyzed by a human, they've done a lot of work for you already by showing you exactly where the low is, and they have even marked its central pressure at 994mb (It's brown and underlined and labeled oddly far to the northeast of the low). It's a busy map... and it is cropped from the original. Is the pressure in Amarillo, TX greater than 1000mb? Thanks for doing the Contour Maps Quiz. The questions were designed to be tricky, but hopefully helped convey the nuances of reading contour maps.